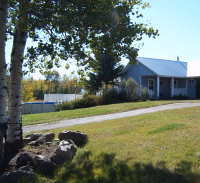 The " Double Dutch Ranch" is located in the south Cariboo and is surrounded by crownland, so the trails seem to be endless. The landscape is hilly, with a lot of trees, open spaces and many lakes. The views from the ranch are breathtaking and the tranquillity is all around you. In the middle of nowhere and yet only 20 min from the nearest town, 100 Mile House, B.C. ( 1 hour south of Williams Lake and 2 hours north of Kamloops) Here you still see the black bears, coyotes, wolves, moose, deer, all kind of birds etc. The Ranch house has a very comfortable " guest suite" with : 2 bedrooms for 2 persons each, 1 bathroom, livingroom, kitchen-diningroom, own terrace and private entrance.You can either stay in the guestsuite or in the Ranch house with the family in a 2 person bedroom with private bathroom. 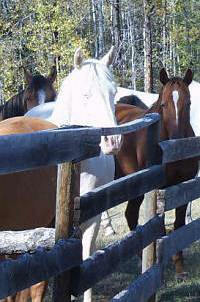 The atmosphere of the ranch is relaxing and friendly, and the trailrides are "easy going ", for every level of riders. We pay special attention to beginners. There is a possibility to take some private lessons, to upgrade your level. 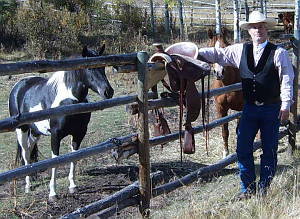 The meals are home cooked and all served in the guest suite, twice a week a BBQ, afterwards a bonfire "get to gether" with " wild" cowboy stories! The guests are able to choose for a full or half day ride, full dayrides will have there lunches packed. After a couple of hours in the saddle, guests can enjoy a swim in our swimming pool. Non riders are also welcome to stay at our ranch and will enjoy the scenery, the tranquillity, wildlife and the swimming pool. Of course there are many other things to do, like hunting, fishing, natural hiking trails, many scheduled festivals. The Cariboo has downhill as well as cross country skiing, hundreds of miles of mountain bike and cross country motor cycle trails, as well as an endless array of watersports and golf.